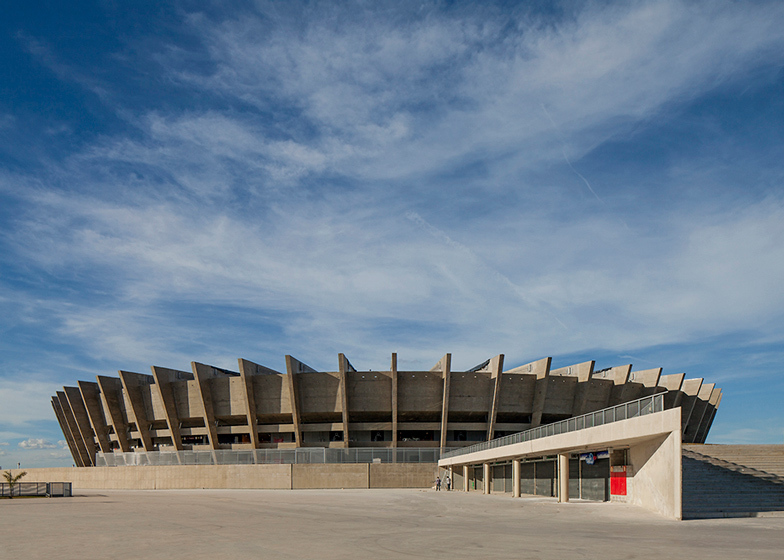 This project by Brazilian photographer Leonardo Finotti examines the architecture and social impact of stadiums that will host matches during the FIFA 2014 World Cup in Brazil, which kicks off this evening in São Paulo (+ slideshow). 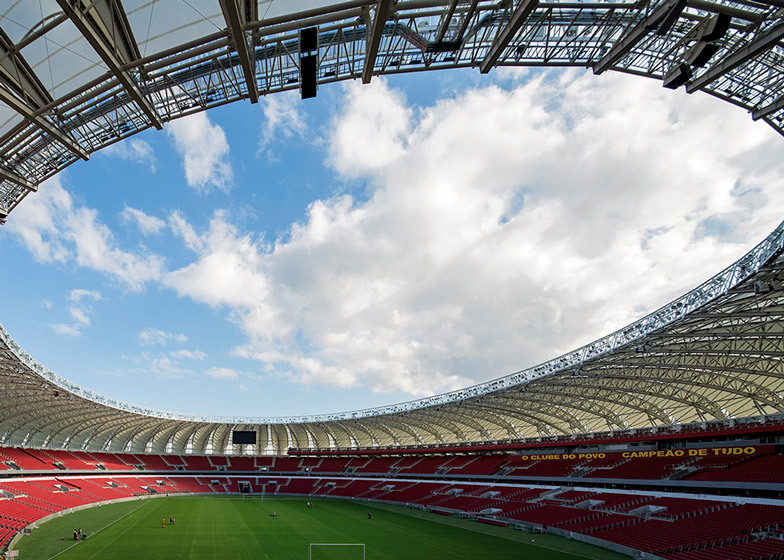 A total of twelve venues have been constructed or renovated for the series of international games due to take place during this year's World Cup, beginning in São Paulo and concluding in Rio de Janeiro in a month's time. 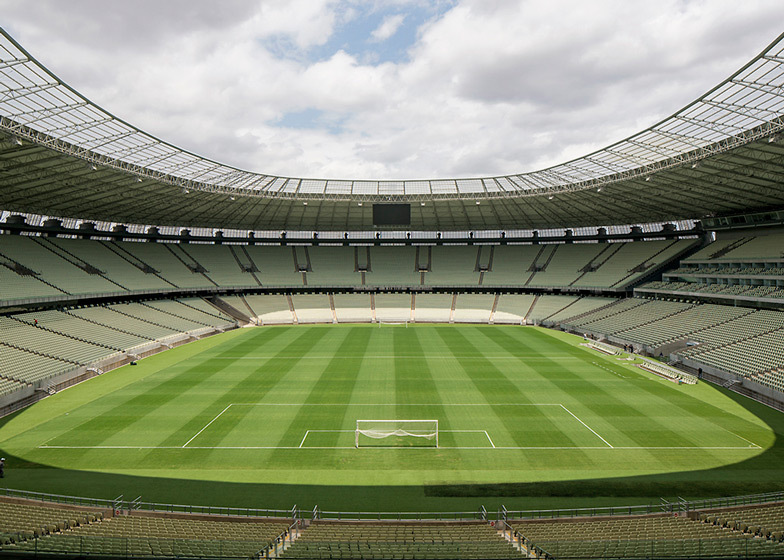 In the run up to the tournament, the media reported unrest across the country as the people of Brazil protested against the government's decision to spend money on the stadiums rather than public transport and other key infrastructure. The organisation and construction schedule has also put coodinators under scrutiny, with a number of deaths on building sites as workers rushed to complete the venues on time. 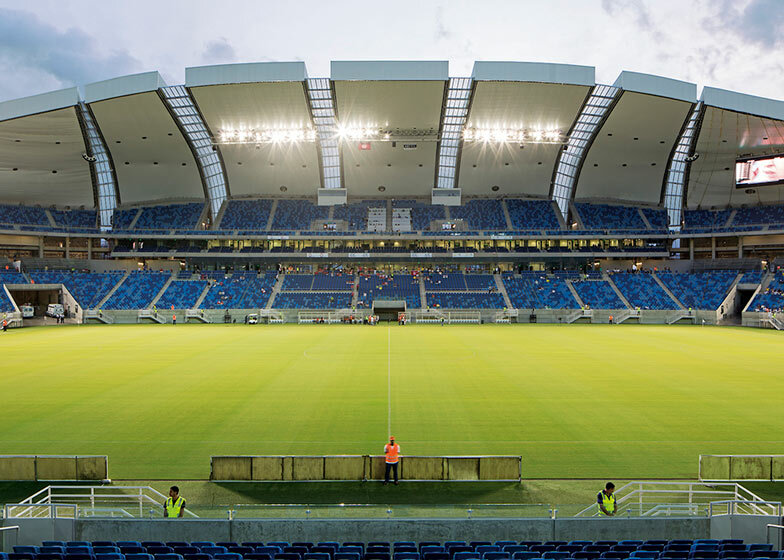 In a country that feels passionately about football and takes great pride in it's national sport, the design of stadiums and related infrastructure always proves controversial. Finotti has doubts about whether the tournament will prove beneficial for the nation's spirit or if host duties have been overshadowed by failures. 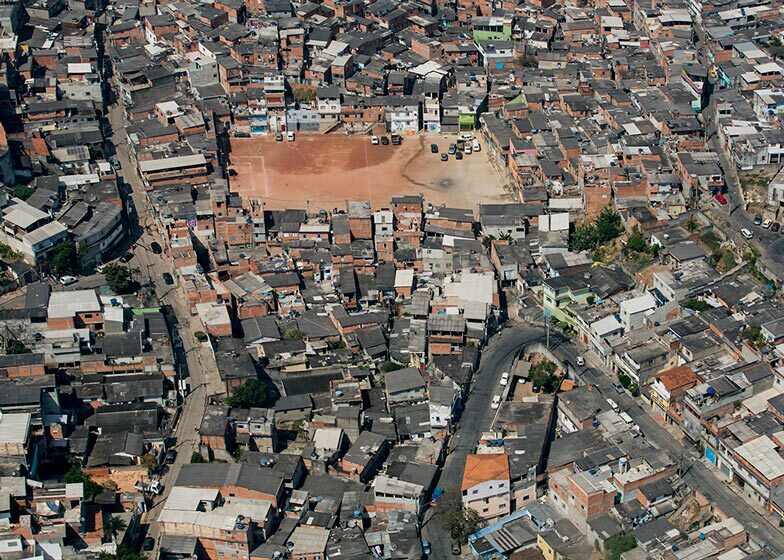 "People in Brazil, me included, are divided between the passion for football and the climate generated by the inefficiency, the more than probable corruption and the arguable decisions related to infrastructure, in a developing country full of contradictions," Finotti told Dezeen. 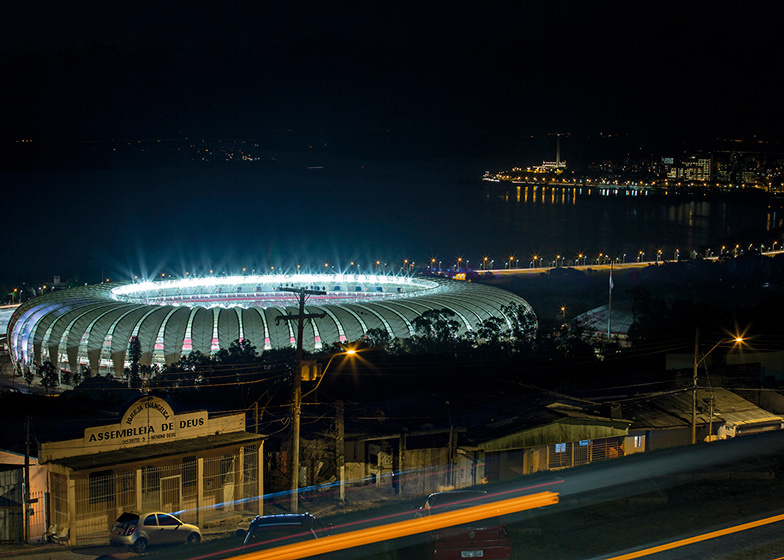 The photographer has travelled around his home country prior to the tournament, documenting the structures that will each fill with thousands of spectators eager to cheer on their countries. 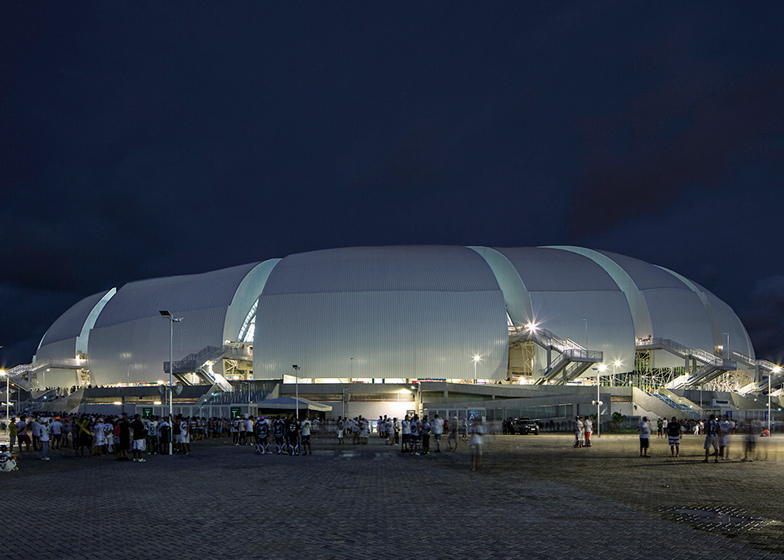 In his pictures, he seeks to contextualise the stadiums and surrounding infrastructure, and provoke thoughts about how these elements affect the social climate in Brazil. "The question is if we are missing a big opportunity to make a difference in public space, infrastructure, transport; all these are real signs of democracy, and it seems that we are not yet prepared to take it seriously," he said. 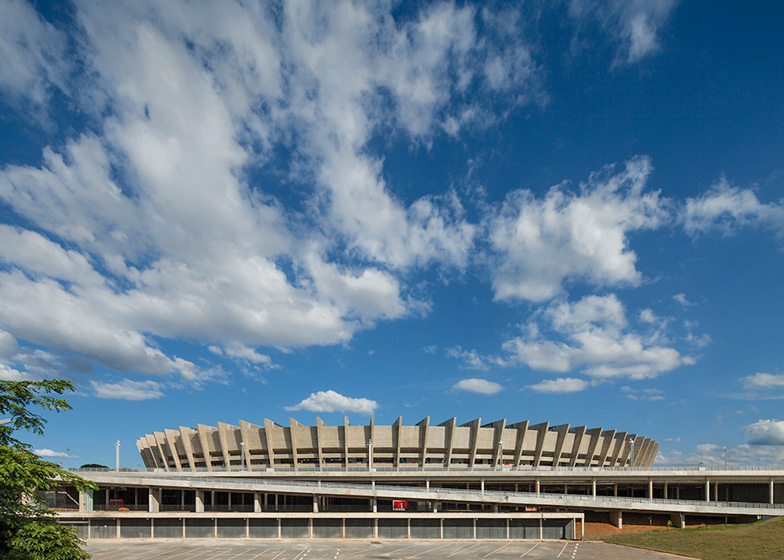 Rather than capturing venues in the tourist hotspots of São Paulo, Rio de Janeiro and Brasília, Finotti has photographed five stadiums in Brazil's lesser-known cities, which he considered the "most important". 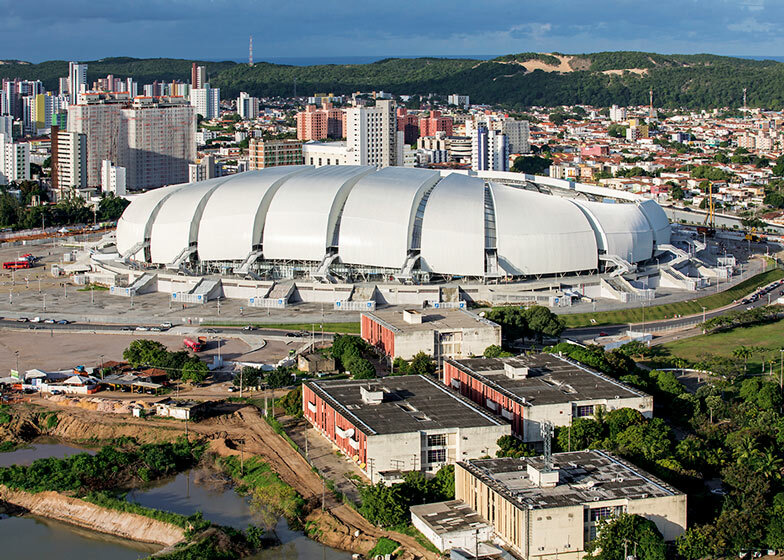 The imposing concrete structure of the 1960s Mineirão Stadium in the Pampulha district of Belo Horizonte has been renovated by local firm BCMF Arquitetos. 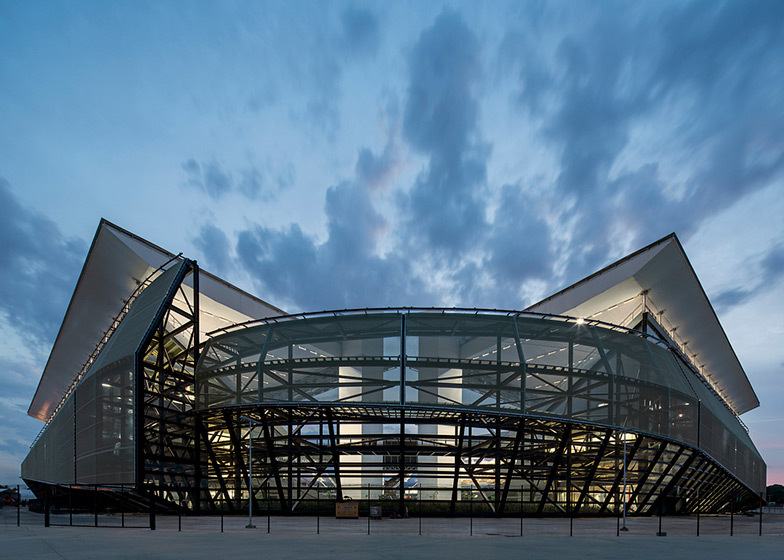 Angular ribs surround the bowl-shaped stadium, which is broken up horizontally into rings and encompasses two tiers of seating. 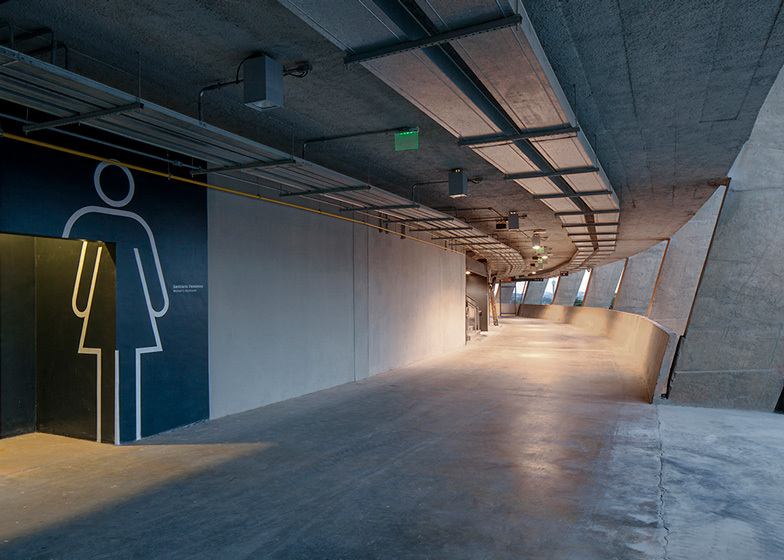 The renovation included the installation of solar panels in strips between the ribs on the roof. 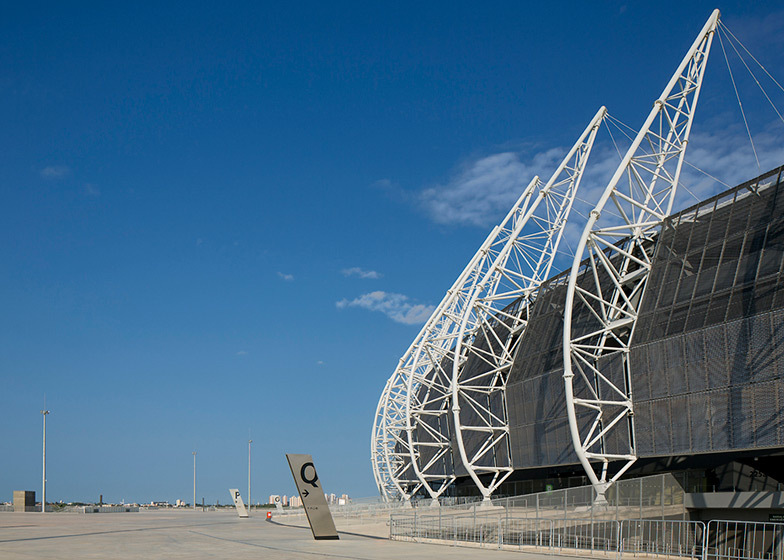 Populous, architects of London's Olympic Stadium for the 2012 games, designed the Arena das Dunas stadium in Natal to mimic the form of a sand dune. 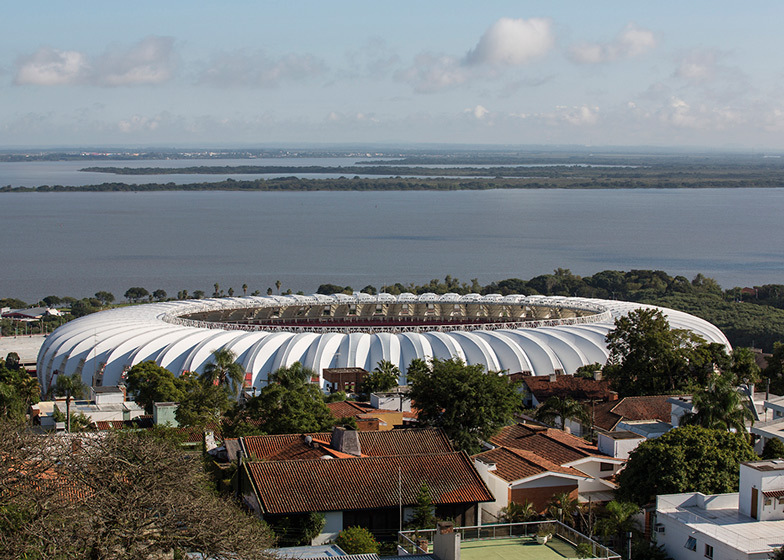 The waterside Beira Rio Stadium in the southern city of Porto Alegre is formed from pleated fins, which curve over the seats and surround the pitch in an oval shape. 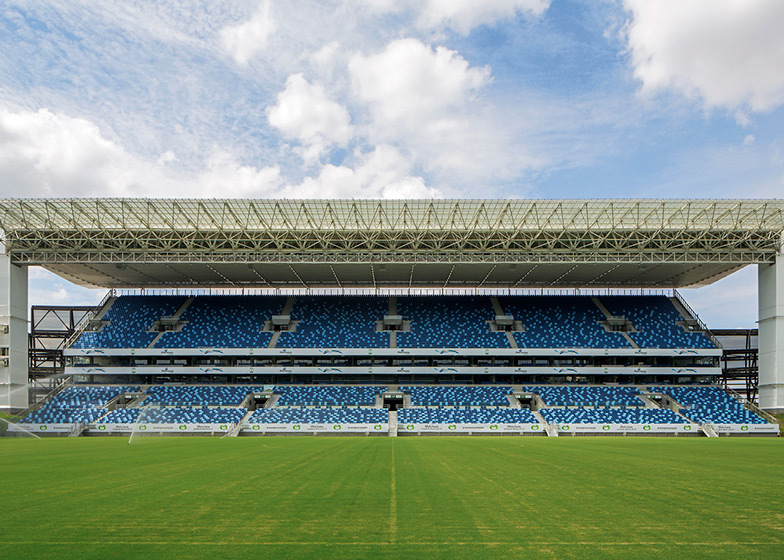 At the Arena Pantanal in Cuiabá, four separate rectangular stands that cumulatively hold 42,968 bright blue seats are wrapped externally with a gauze-like material, connected the elements together. 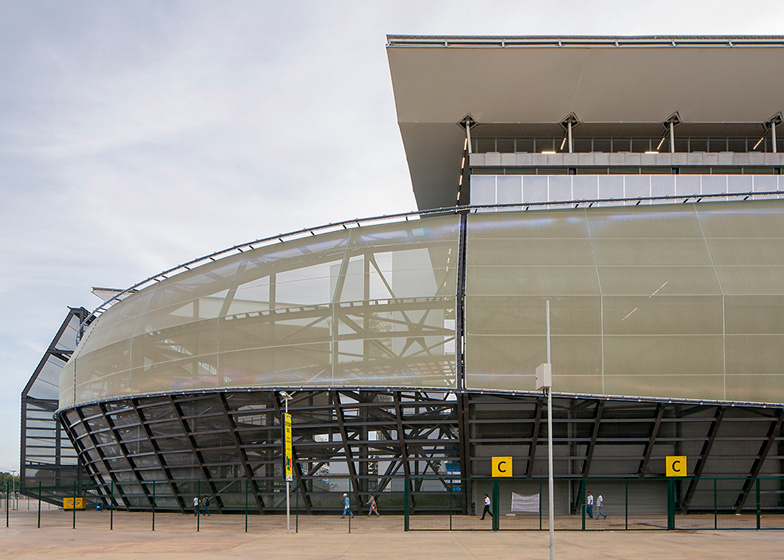 Brazilian firm GCP Arquitetos supported the roofs over the stands with chunky pillars at each end. 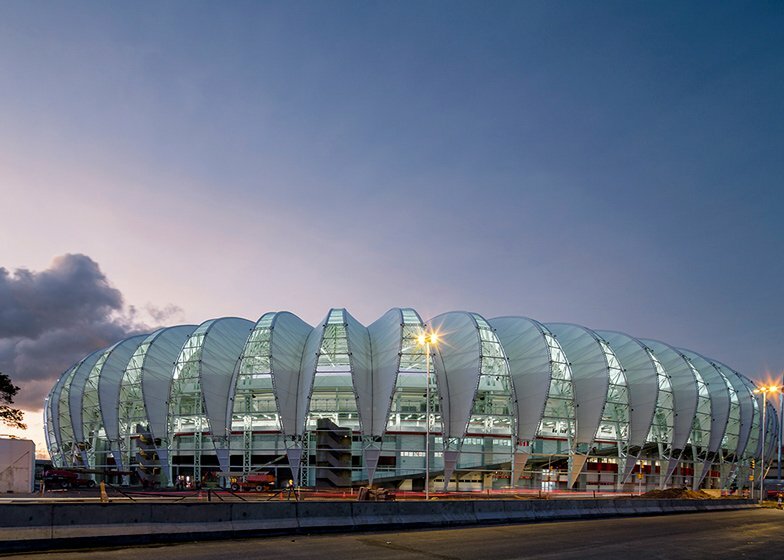 In contrast, the roof of the Castelão Stadium in Fortaleza by Vigliecca & Associados is suspended from wires that emanate from a series of curved white pylons around its exterior. 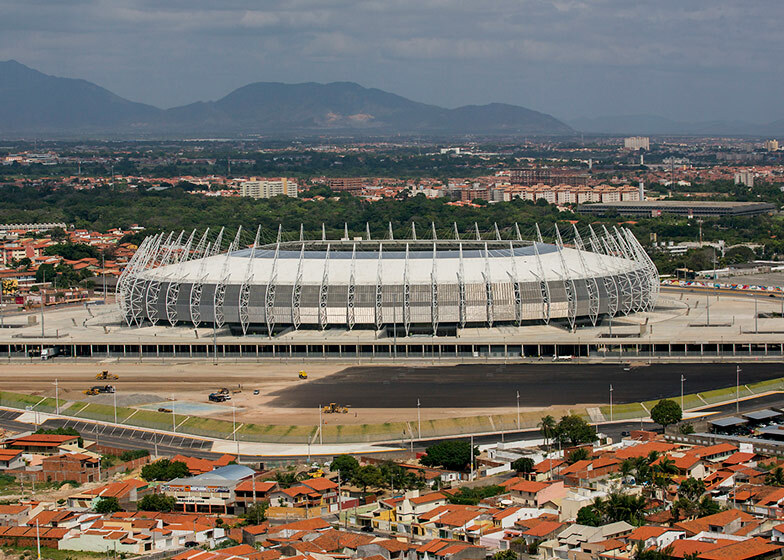 "While I covered the most important stadiums and tried to show its main features, at the same time I was devoted to a parallel (and maybe opposite) work on anonymous soccer fields called Pelada," said Finotti. 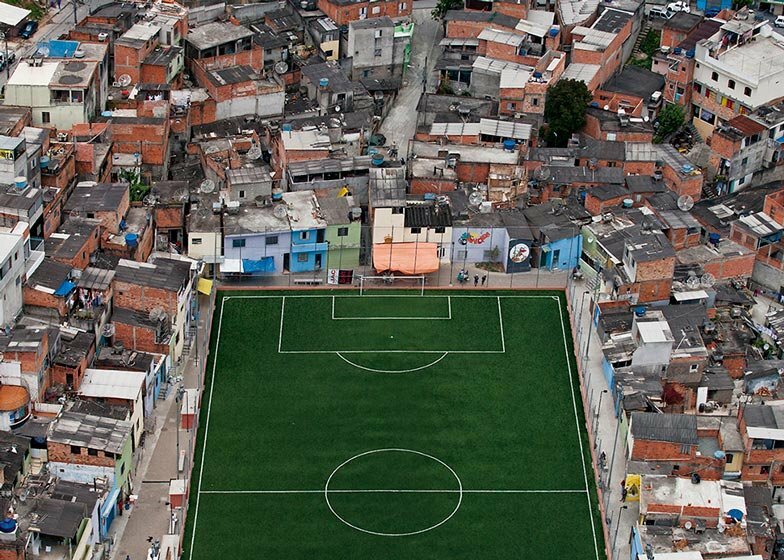 His contrasting images show how local football pitches are integrated into the urban fabric of São Paulo. "In a place with a total lack of order, these fields bring the absent structure," he said. "But they do even more: these soccer fields act as a resistance of the public realm, right where is more necessary; its particular function establishes an almost sacred public space, but its role goes beyond sports, providing leisure, joy and civic values." "I think that both kind of works are related, and Pelada shows how easy and inexpensive would be to build democracy using soccer. I hope we don't miss the next opportunity!"